Most of these articles were written by me (Katie Bartlett), but some have been contributed by other clicker trainers. I have grouped them by category (alphabetically). If you are new to clicker training, you will want to start by reading the articles under CLICKER BASICS, FAQ, and GETTING STARTED. Those articles are also available here if you scroll down, or you can get to them from the sidebar menu. I wanted to have all the articles in one place, but also offer suggestions for what to read first which is why I organized it this way. How I Found Clicker Training - If you are curious about how I got started clicker training, here is the story of how I learned about it. Why Clicker Training? - Are you considering clicker training? In this article I share some of the reasons why I like clicker training and what makes it different from other training methods. Thank you Mr. Rogers - Mr. Rogers (of the children's television show) passed away soon after I started clicker training. I read an article about him in the newspaper one morning and it prompted me to write this post to the clickryder list. Should you click offered behaviors? A look at stimulus control. 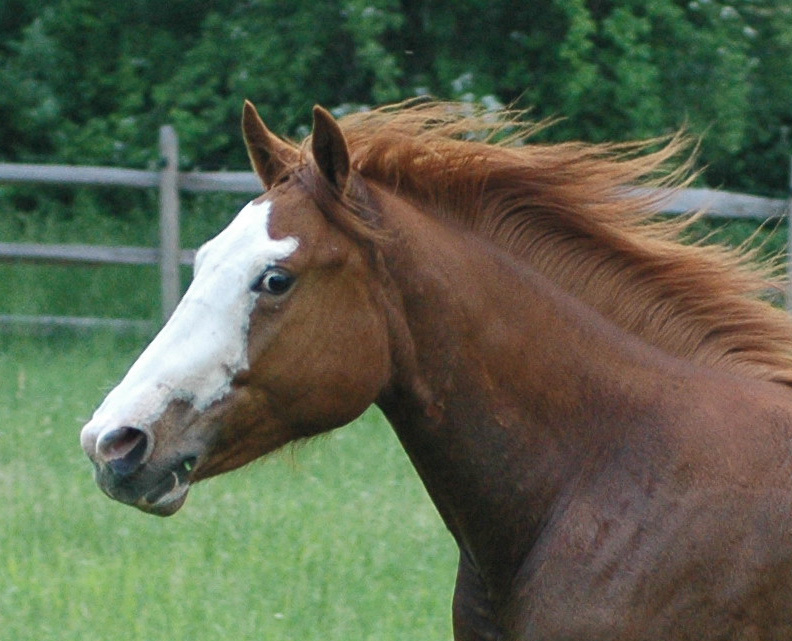 Clicker trained horses love to offer behaviors off cue and it is one of their charms that they are so enthusiastic, but should you click offered behaviors? Is it possible to click offered behaviors without losing all stimulus control? Here is a look at how offered behavior fits into the structure of training and how to decide whether or not to click. (April 2007) To read this document as a pdf, click offered_behavior.pdf. Duration: Training Strategies and how to develop duration in the clicker trained horse An in-depth look at duration in the clicker trained horse. What is duration? 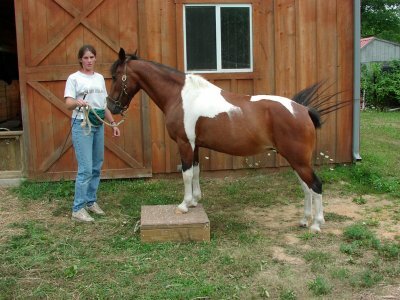 How can I train a horse that works for longer periods of time? This article has strategies and tips for starting to work on extending behaviors for longer periods of time. It also has information about how to build duration without sacrificing quality, and how to help your horse develop the emotional stability it needs to be successful at working for longer periods of time without a click. (February 2006)To read this document as a pdf, click duration.pdf. Taking Clicker Training From the Classroom to "Real Life." This article explains how to make the transition from teaching a behavior to using a behavior. It is great for anyone who has a basic understanding of clicker training but uses it in a limited way or for anyone who wants to expand their use of clicker training into other interactions with their horse. (February 2014). Getting Started with Riding: Common Questions. A follow-up to the previous article on handling food. This one covers topics related to stopping for food, clicking behavior and how to work toward more advanced training. (March 2015). About Clinics: Clinics are important. They provide feedback, inspiration, networking, and good visuals for Alexandra Kurland's exercises. If that is not reason enough for you to think of attending a clinic, you can read here why I attend clinics. Clinic Reports from 2006-2008 - these were written mostly by me and are from the advanced clinics in Groton, NY plus a few others. Micro-Riding posts from Alex: Micro-riding was the clinic theme for 2008. If you read the clinic reports from that year, they reference these posts of Alex's which she has given me permission to include here. Loopy Training: Instead of writing regular clinic reports in 2009, I wrote this post in the fall describing Loopy Training which was the theme of the 2009 clinics. Alexandra Kurland Advanced Clinic: Toutle, Washington, October 2010. In 2010, I decided to attend the advanced clinic in Toutle, Washington instead of going to Groton as usual. I wrote this clinic report to share what I learned from that experience. Alexandra Kurland Advanced Clinic: Groton, NY, May 2011. I posted these notes on facebook instead of writing a formal report. I have collected them all here so it is easier to read. Alexandra Kurland Advanced Clinic: Groton, NY, August 2011. I took Red to this clinic where we looked at Hip Shoulder Shoulder, neck ropes, energy, keeping the horse forward, and acting. Alexandra Kurland Advanced Clinic: Groton NY, August 2012. I posted some notes on facebook instead of writing a formal report. The notes cover topics such as food delivery, clicker compatible tools, and rope handling. An Overview of the Training Progression from Groundwork to Riding Using Alexandra Kurland's Rope Handling and Single Rein Work: A look at why the rope handling and single rein work are important, how you get from groundwork to riding and what you can incorporate along the way. (the six AK foundation lessons are targeting, head down, backing, happy faces, matwork, and grown-ups.) Look under "GETTING STARTED" for articles on targeting. Value of Mat work by Margaret Leach - Mat work can be invaluable for teaching horses to stand still and sending them to a location. But it can be used for much more. Margaret describes how she has used mat work in her training and has created a chart showing how mat work can be used to teach everything from ground tying to liberty work. 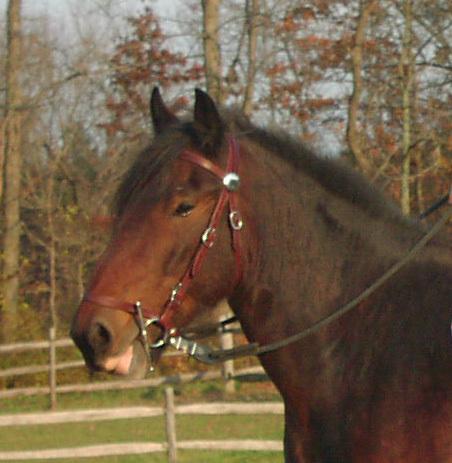 Ears Forward or Happy Faces: A story and some strategies and tips - Do you have a grumpy horse? Are you interested in teaching ears forward but not sure how to do it? Are you wondering if it will make any difference? This article documents how I trained Rosie to put her ears forward and how it changed our relationship. What is Equine Clicker Training and How Do You Apply it to Horses? - If you are new to clicker training, this is the first article you should read. It gives a brief overview of the science behind clicker training and a description of the 6 ways clicker trainers get behavior. Training a Behavior from Start to Finish - A general overview of the steps from getting the behavior to having a finished behavior on cue. If you are new to clicker training, this will explain when clicker trainers add cues and a bit about stimulus control. Stages of Clicker Training by Elaine Elmer. Elaine has clicker trained a lot of different horses and noticed some consistent patterns which she shares in this article. It is a look at some of the stages horses go through as they become more experienced clicker horses, from the "All you can eat food bar stage" to the "eureka" stage. How to Use Different Food Delivery Techniques as Part of Your Training: There's more to food delivery than just feeding the horse where he is standing. Learn how to use food delivery to help shape behavior, reinforce positions, create resets and more. March 2014. Clicker Expo is a 3 day teaching and training workshop put on by Karen Pryor's clicker training organization. The event usually happens twice a year, once on the west coast (usually in January) and once on the east coast/midwest (usually in March). For more information on Clicker Expo for this year, visit Karen's web site which is www.clickertraining.com. Clicker Expo 2006 - This was the first one I attended in Rhode Island. I don't seem to have a report for it, but I might have sent it to one of the groups. If I can find it, I'll add it here. Clicker Expo 2007 (this is a general report about sessions on targeting, modifier cues, tai-chi rope handling, using research as a clicker trainer, common "speed bumps" encountered in learning clicker training and advanced training tools). Taking Clicker Expo Back to the Horses: this was written a few months after Clicker Expo 2008 and shares how I tried to apply what I learned at Clicker Expo to my own work with my horses. Clicker Expo 2010 (I didn't write this one up as individual sessions, but the report deals with the elements of clicker training (the marker signal, food delivery, reinforcement and training strategies). Clicker Expo 2011 Topics include aggression, anticipation, microshaping, using play to teach self control and super skills (Kay Laurence), working with vets, behavior chains, generalization, and improving your observation skills. Ken Ramirez: July 2012. I attended a two day seminar with Ken Ramirez and shared some of what I learned on facebook. This article is a collection of those notes. Ken Ramirez is on the Clicker Expo faculty so some of the material is similar to or complements that in the Clicker Expo notes, which is why I listed this article here. Clicker Expo 2013: Topics include myths, missteps and mantras, connected walking, cues and context, respodent vs. operant conditioning, negative reinforcement, teaching, and Dr. Susan Friedman. Clicker Expo 2014: Topics include extinction, resurgence, aggression in puppies, combining classical and operant conditioning, default behaviors, practicing, strategic food delivery, fine slicing, performance prep (foundation behaviors), using reinforcement to get rid of unwanted behavior and training for its own sake (not for performance goals). Reward Ends, Then What: These are my notes on Eva Bertilsson and Emelie Johnson Vegh's talk on the importance of what happens after the reward. This lecture was given at Clicker Expo 2015 but I viewed it as a Clicker Expo video session. 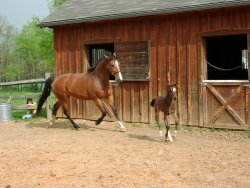 Clicker Training Foals to Halter and Lead by Barbara Ray - do you have a new foal you would like to start with clicker training? 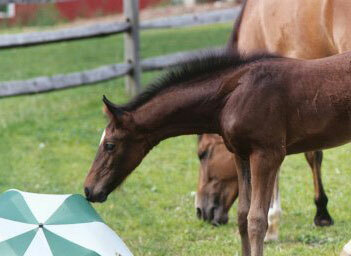 Barbara has many years of experience teaching foals basic handling skills in a gentle and positive way. She explains how to teach your foal about pressure and release and how to follow your feel. Zan's story: This is the somewhat humorous account of Rosie's foal from birth to 18 months. There is some training information mixed in, but it is not intended to be used as detailed instructions. There are separate pages for each month. This link takes you to the first one. Happy New Year 2009: An update I posted in January 2009 describing what I had been doing with my own horses. Measuring our Progress by Melissa M. - What can you do in a year with a horse that isn't ready to ride? Melissa looks back at all the things she has taught her mare Ruby. A great resource for those of you with young horses to show how all those little training sessions add up. The Nudge: Stella offers some insight into how we interpret what our horses do. Putting Our Heads Together: Why you should spend time making sure your horse is comfortable having his head handled. Getting started - How do you actually get started with clicker training? A description of three common ways to introduce the clicker and get started. Targeting Handout - This handout answers questions such as what is a target? What you can you do with targeting? Katie Bartlett 2011. Improve Your Clicker Training Skills: suggestions for ways to supplement your clicker training time with other activities that will make you a better clicker trainer. A good list for things to do in the winter if you can't get out and train (September 2009). The Three Part Series on Using Clicker Training with Operant Conditioning. These articles are long. If you prefer to print them out or read them in a different format, there are pdf versions that you can view and download directly. Click on four quadrants, negative reinforcement, or thinking outside the box. Intrinsic vs. extrinsic motivation: A few notes from Inge Teblick's Theory of Fun course where she talks about the differences between intrinsic and extrinsic motivation. The Art and Science of Animal Training Conference 2013. This year's conference was on February 2 and the speakers included Dr. Susan Schneider, Bob Bailey, Phung Luu, Steve White, Alexandra Kurland, Kay Laurence and Ken Ramirez. The Art and Science of Animal Training Conference 2014. This year's conference was on March 22, 2014. The speakers were Dr. Jaak Panksepp, Bob Bailey, Phung Luu, Steve White, Alexandra Kurland, Kay Laurence and Ken Ramirez. The Art and Science of Animal Training Conference 2015. This year's conference was on March 14, 2015. The speakers were Dr. Stanley Weiss, Bob Bailey, Phung Luu, Steve Aibel and Al Kordowski, Steve White, Alexandra Kurland and Ken Ramirez. The Art and Science of Animal Training Conference 2016. This Link takes you to my blog which is where I posted this year's notes. You can find a link to each presentation in the archives. The conference was on February 20-21, 2016. The speakers were Dr. Iver Iversen, Dr. Jesus Rosales-Ruiz, Dr. Joe Layng, Kay Laurence, Mary Hunter, Steve Aibel, Steve White, Alexandra Kurland and Ken Ramirez. The Art and Science of Animal Training Conference 2017. This Link takes you to my blog which is where I posted this year's notes. This year I combined some of the presentations that shared common themes into a single article, instead of one for each presentation. But, you can still find notes on each presentation within the articles. 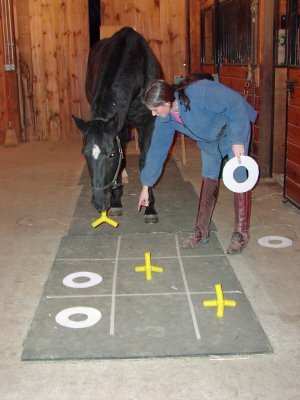 Ways to use cones in liberty or lunging work - Most of us use cones to mark places for the rider or handler, but how about teaching your horse to respond to the placement of cones. Here is the story of how I started using cones in round pen work and ended up being able to use cone gates to exercise my horse at liberty in an assortment of patterns and at different gaits. Stella: an introduction and overview of training the latest member of the Bartlett herd. Stella came from a rescue and needed some training. Using clicker training for neurological rehabilitation of a horse by Margaret Leach - We all know that clicker training is great for working through aggression and fear issues and for teaching fun new skills, but what about using it to help a horse overcome a serious medical problem. 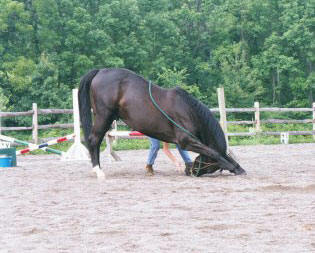 Margaret's mare Serena suffered a severe neurological problem, so severe that she could barely walk in a straight line. Here is the story of her illness and how Margaret used clicker training to help Serena relearn how to organize her own body to become rideable again.